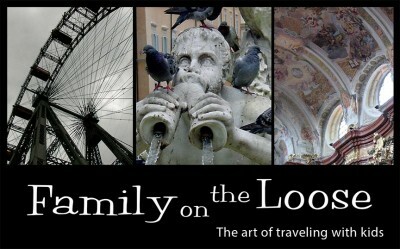 Join the Multicultural Kid Blogs Book Club as we begin 2014 by reading Family on the Loose: The Art of Traveling with Kids. – In weekly posts, Multicultural Kid Bloggers will discuss Family on the Loose and share their own travel stories and tips. – On March 6, Author Ashley Steel answers questions about the book and traveling with her family. – Read along and join the conversation as we talk about our experiences and plan for new adventures! – This engaging book offers hundreds of easy-to-use ideas for turning travel with kids into a rewarding, enriching adventure. – Bill Richards and E. Ashley Steel have traveled through North America, Europe and Asia with their two daughters. They bring vast experience and a wonderful sense of humor to their discussion of family travel. – Read more about Family on the Loose on the authors’ website. – Beginning Jan. 9, we will be posting once a week on different chapters. – Join the conversation by following the participating blogs and leaving comments with your experiences, ideas and questions. – To be notified of new posts by email, join the group list by emailing multiculturalkidblogs at gmail. com. Please put “book club” in the subject line. – Share your ideas in the Multicultural Kid Blogs Google + Community. – Link up your travel stories on Multicultural Kid Blogs. – Follow our Travel with Kids Board on Pinterest. Family on the Loose is available on Amazon. Multicultural Kid Blogs are dedicated to raising world citizens, through arts, activities, crafts, food, language, and love. You can follow Multicultural Kid Blogs on Facebook, Pinterest, Twitter, and Google+. You can also subscribe to a feed of all of posts from the Facebook pages of all member blogs. I’m really looking forward to starting this book. I’m staying with family over Christmas and made sure that I packed it so as I could read the opening chapters that I’m focusing on my blog post.